Ponsonby Hall, which stood on a site next to the police station in Jervois Road for many years served all the needs of the district. It was originally a store, erected by the Government near the main gate of Government House on Barrack Hill, for storing war material. When the war was over there was no use for the building and Messrs T T Masefield and Field succeeded in getting the Government to allow it to be removed to Ponsonby, those two gentlemen acting as trustees for many years. In August 1873, “several inhabitants of the district” held a meeting in the rooms of the Auckland City Council where it was resolved “to form a Ponsonby Hall Company of 600 shares of £1 each.” The provisional directors appointed were Stannus Jones (chairman), James Stodart (secretary), James Morton (treasurer), G W Owen, D A Tole, Andrew Stewart and James Dacre. (Special meeting report, NZ Herald, 31 March 1875). Masefield’s name only turns up on the list of directors of the company elected in 1875, so Stichbury’s recollection where he and a Mr Field obtained the building is somewhat muddled. Also, as it turns out, the “trustees for many years” description was probably not correct, either. It is finally decided by the people of Dedwood that a public hall shall be erected, fronting the Ponsonby road, the spot where the 'buses start from. A plot of land has been secured, and a large number of shares taken up. Tenders are asked for by Mr Mahoney, the architect, which must be sent to his office by Saturday next. The neighbourhood of Dedwood is being thickly studded with houses, and shortly it will be impossible to get an allotment in the district. The proposed Ponsonby Hall is to answer all the purposes of an institute, will possess a library for the accommodation of all readers, and a chess and reading-room for the pleasure and amusement of persons of advanced years. Two buildings were apparently purchased from the Improvement Commissioners, for £125 and £55, according to the 1875 report, but this with an earlier report from the hall’s opening (see below) which indicates a single building (armoury) purchased, and a different sum of money in total for “building” (much less). A building was purchased at auction from Albert Barracks on 8 August 1873 by Stannus Jones, "one of the largest buildings, a very fine structure about 40 feet by 80 feet ... as a public hall for Dedwood." (NZ Herald, 9 August 1873) It seems that those who moved ahead with purchasing the buildings and materials, commissioning the architect, hiring the builder, buying the land -- did so in a rush, to ensure that things got done, but without taking time to fully ascertain exactly how much financial support they could get. The hall was, from the start, a commercial proposition. That was its undoing. 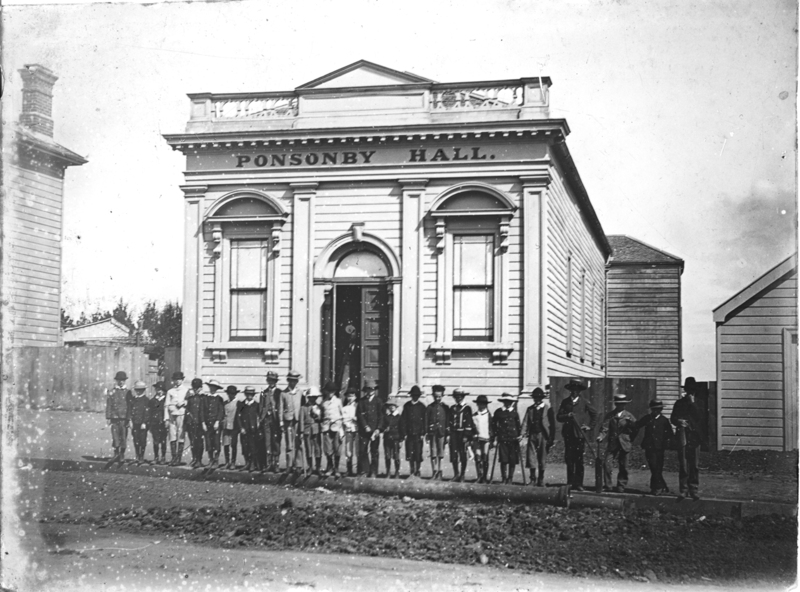 PONSONBY PUBLIC HALL. 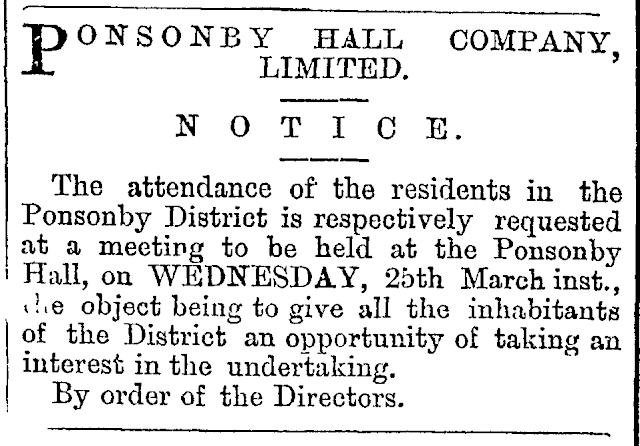 A meeting of the residents in the Ponsonby district was held in the new Public Hall last evening. About seventy gentlemen were present.—Mr. Stannus Jones occupied the chair, and stated the object of the meeting. It was to give an account of the building of the hall they were assembled in, and to enable the residents of the district to give an expression of opinion as to whether the hall was required or not and if it were, they would be asked to become shareholders. The Chairman then narrated the action which he and six other gentlemen had taken to build the hall. They considered that a public hall was necessary, and when the buildings in the Albert Barracks were sold they purchased one, which supplied the material of which the present building was constructed. A considerable advance upon the price given was offered them on their purchase the following day, but it was bought for the district, and they considered it better to make financial arrangements, erect the building, and then ask the residents to approve or disapprove of what had been done. They formed the committee, and purchased the present site for £100 cash, and had the building erected. The fee simple of the land and building had cost £921 0s 1d. They had formed a limited association of £1 shares, and if those present approved they would have an opportunity of subscribing. When the shares were taken up they proposed to hand over the hall to trustees appointed by the shareholders. A building such as the one they were in could not be built for less than £300 or £400 more than this one had cost. It would be for the meeting to approve or disapprove of the action which had been taken; and if they approved they would do so by giving their assistance. From time to time they had asked a few gentlemen to subscribe, and they had taken the number of shares opposite their names in the share-list. The total number of shares already subscribed for was 230, a very large proportion of which were taken by non-residents in the district. The committee had acted in faith for the district, and were simply liable for the £600 due on the building. If the residents of the district thought the hall was required, and that it was a cheap and good one, they were asked to take shares, the responsibility of which rested with the amount of the share only. They desired the shares to be distributed over the district, and to have the hall a nonsectarian and district property. The shareholders would appoint their own directors. He had no more to do with the hall than anyone else who had paid his pound. His interest in the building was exactly 10 shares. The proceeds of the concert would go towards liquidating the debt.—Mr. Morton Jones said an enquiry was made as to whether the share must be paid up at once in full or by instalments.— The Chairman said that, so long as the money was not kept back too long, it might be paid in instalments, as the interest at the bank would be a mere bagatelle. The object desired was to have the shares scattered throughout the district. They did not want any person to hold more than ten shares. He asked for an expression of opinion.—Mr. Bullock moved, in order to elicit the feeling of the meeting, “That this meeting, having heard the statement of the provisional directory, approves of their action in the matter, and pledges itself to further the object of the Ponsonby Hall Company by using its best exertions to obtain additional shareholders.” He said it had been a very general impression that a public hall was not only desirable but necessary, and those who were of that opinion, he thought, should give practical proof of it by moving in the direction indicated in the motion.—Mr. Boardman seconded the resolution, and said it would be clearly understood that the company was a duly registered company, and not a private association which might collect funds and afterwards use the building for any private purposes. Mr Boardman spoke strongly in favour of the motion, and also advocated the establishment of a free public library in connection with the hall. His remarks were well received, and the motion being put was carried unanimously. A large number of shares were taken up at the meeting after the passing of the resolution. The following is the full statement of the costs of the land and hall: Land, £100; building, £158; Dawson (contractor), £475; painter, £90’ gas fitter, £29 15s 1d; registration, £11 5s; insurance, £5; architect, £30: total, £921 0s 1d. The amount subscribed before the commencement of the meeting was £237 10s, leaving a balance to collect £683 10s 1d. The opening concert in connection with the Ponsonby Hall will be given this evening. While the hall was popular, and it did serve as a centre of culture, local democracy, the formation and fostering of other community groups in the area – it was also a bit of a white elephant, right from the start. A meeting was held 16 March 1875, where it was announced that few share offers had been taken up, so the company’s capital was very low, while their debts and liabilities seemed mountainous. [Mr Boardman] was also strongly opposed to the attempt to wind up the company, which meant the sale of the hall, and its loss as a public hall to the district. He thought that sufficient efforts had perhaps not been made to carry out the original design of the promoters of the hall, which was to enlist the sympathies of the bulk of the population, by providing entertainments, concerts, lectures, etc, also a reading-room and free public library. He had a strong desire to preserve the property in perpetuity for the inhabitants of the district, and would like to see it placed in trust for that purpose, in the Highway Board for the time being, or in some other way. He suggested that a district bazaar might be got up, which he believed would realise £250 net at the least; that the unsold shares should be disposed of, if necessary, at a discount; that at the next annual meeting of ratepayers a proposal should be made to levy only a rate of three farthings in the pound for road purposes, and make a voluntary rate of one farthing to be specially applied to reducing the debt on the hall; the total taxation would not be thus increased, while the hall would benefit considerably. If all these failed, the hall should be offered to the Central Board of Education as the public school in the district, for which it is admirably adapted; the Board taking over the liabilities, which it was stated, were scarcely two-thirds the value of the property. Mr Stewart was doubtful whether a bazaar would be successful, and it would take time, and involve a good deal of expense. A special general meeting was held later in the month to decide on whether to wind up or not. The result, however [of the grand opening], was not equal to expectations, the net gain to the company being only £6 17s. Since that time several troupes were engaged to give performances in the hall, but in no instance did the company reap any pecuniary benefit from them. On these occasions the company were much indebted to Mr and Mrs Stodart for assistance in various ways. A musical society and a chess club were formed, and from them a small revenue was derived in the shape of rent. In June last a loan of £680 at 8 per cent, was obtained on which enabled the board to settle with Mr Dawson, the builder, but still left an overdraft at the bank unpaid. The National Bank required the overdraft paid on the 31st of the present month, and the directors had come to the conclusion that the best means by which to reimburse themselves for the outlay they had incurred was to wind up the present company and let the hall pass into the hands of a new company of larger capital and smaller means. It looks like efforts to secure enough local financial interest failed. The company conveyed the land to the Crown in October 1879 (A3.114), and while the Hall continued to be a community focus for many more years, its fate was essentially sealed. 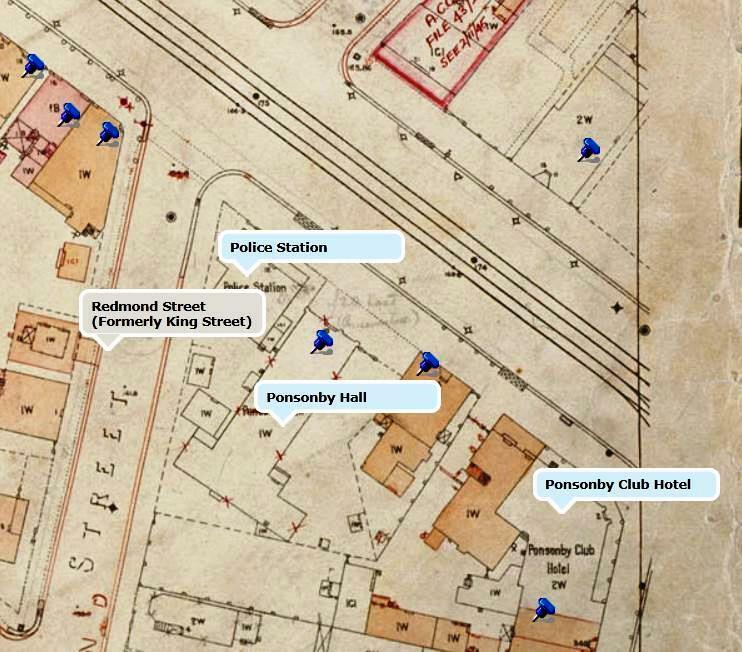 Detail from Sheet D8 of City of Auckland map 1908, ACC 014, Auckland Council Archives. The Public Works Department has called tenders for the removal of the Ponsonby Hall. The building, which is situated in Jervois Road, near the Three Lamps, is owned by the Government, and the section is vested in the Police Department. A little revenue has been obtained, from the letting of the hall, but applications for its use have not been very frequent. In consequence of this, and owing to the fact that further accommodation is required at Ponsonby for police purposes, the Government has decided on the removal of the building. The old Ponsonby Hall, adjoining the Ponsonby police station, is being pulled down. The section upon which it stands is to be reserved for future extensions to the police premises. Although no steps have been taken towards adding to the present depot enlargements will be necessary at no distant date. I never went to the gluepot, think I was too young when it was in it's hey day. I wish at least part of it was still called Dedwood. Dedwood is, I agree, a much cooler name.